Probably the easiest way to understand how a pressure washer functions is to diagnose a unit and see how it is constructed. We have selected a cold water portable unit for this purpose. 1. First you have your power source (engine or motor) this is what creates the energy to drive the pump. Then there is the nozzle that determines the cleaning effect. 2. The heart of any pressure washer system is the high pressure pump. They are a positive displacement reciprocating type pump – either plunger or piston version. Plunger is the most common as they are more efficient and have longer life. Plunger pumps represent 99% of the pumps found in the professional power wash industry. Plungers are usually made of ceramic which is very hard and less prone to wear. Plunger pump can be described as a plunger that moves back and forth against a stationary seal or packing. Whereas a piston pump is where the packing is attached to the piston rod and moves against a smooth cylinder wall. Piston pumps generally have better priming characteristics but cannot operate at as high a pressure and have shorter life. An important feature of the plunger/piston pump is that the volume capacity of pump depends on pump speed. So long as pump is rotating the same volume of liquid that goes in must come out. This is why blockage can be dangerous and why safety devices such as unloader valves and safety pressure relief valves must be incorporated into system. As the plunger moves back, water is drawn into pump cylinder cavity through inlet check valves. When plunger moves forward, the inlet valves close, forcing water to travel through a series of outlet valves and to the discharge port of pump. This can also be compared to a combustion engine that we crank up every day. Intake valves bring gas into the engine on the down stroke and on the up stroke the intake valves close and when combustion occurs the exhaust valves open. Most plunger pumps are either duplex or triplex. Two-piston pumps have higher pulsations and are harder on system components and the operator. These pumps will require the addition of an accumulator to reduce vibration. Triplex are the most common used for pressure washers as they result in smoother flow. Newer higher speed pumps (direct drive – 3400 rpm pumps) also result in less pressure fluctuations and require less starting torque; however, they result in faster wear, have less suction lift capability and sometime noise is high pitched and can be irritating. 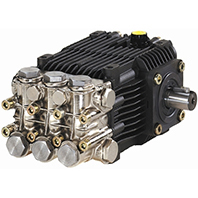 The best and longest lasting direct drive pumps in the industry are the Allison series pumps. The last as long as the lower rpm pumps and suction lift is not an issue. Unfortunately since pump is the core of the pressure washer it is generally blamed for any system failing. However, generally 90% of pressure washer problems are not the cause of the pump. Most can be attributed to system restrictions or component wear such as nozzle, etc. Pump starvation of liquid is probably the leading cause of premature pump failure. Inlet line restrictions does not allow adequate water to enter pump resulting in cavitation. Cavitation is when air mixes with water causing small explosions to occur when pressurized which will tear away at packing or piston surface.